Mizuna lettuce is a great introduction to the Japanese leafy greens, easy to grow. It has a milder taste than most, and both the red and the green variety taste the same. Besides being good for you as it is high in Vitamin C, it also looks great in salads where the finely cut leaves add texture. You can grow it at home, and the taste is best described as water cress with a bit of a bite to it. How do you use Mizuna ? Usually the young leaves are picked and added to salads. Older leaves and the stalks can be used in a stir fry. You can add it to pesto for a bit on tang. It is traditionally pickled and used as an appetiser. Try tossing them in with potato salad or add them to an omelet. 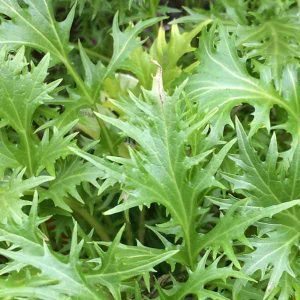 You can start Mizuna from seed or seedlings. It does require a rich moist soil, however it can be planted close together. From seed to first harvest will take around 8 weeks. The best time to plant it is in autumn, and then grow it through until late spring/early summer. Harvest as required, young leaves are best for salads.